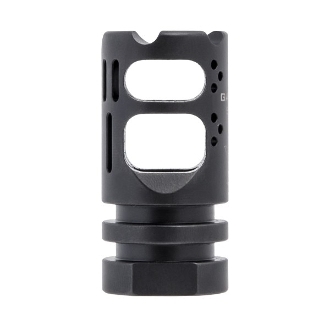 The VG6 Gamma 5.56 is a High Performance Muzzle Brake for Eliminating Recoil. For discerning users looking for every advantage we offer the Gamma556. The VG6 GAMMA 556 was designed using state of the art engineering techniques, utilizing CFD (Computational Fluid Dynamics) and CAE (Computer Aided Engineering). 100% CNC machined for optimal performance. The VG6 GAMMA 556 has been tuned for versatility. While it is perfect for SBR’s and AR pistols the brake has been optimized for 10.5" to 18.5" barrel lengths. The Gamma556 will allow you to saturate the target no matter how fast you shoot. Also available in Gamma556 EX model. This model is 2.21 inches and it the correct length to pin and weld to 14.5” barrels to complete the fixed 16.01” barrel length for a rifle. This GAMMA 556 muzzle brake gives you No More Recoil. * Do NOT use with any other muzzle attachment devices like sound suppressor. Please use the GAMMA 556 only.